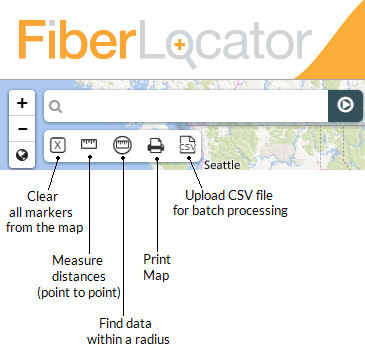 The following is a series of 10 quick usage tips for getting started with FiberLocator 3.0. As always, if you have any questions please contact us at 888-275-2264 or via email at support@www.fiberlocator.com. To access FiberLocator 3.0, go to https://app.www.fiberlocator.com, enter your user name and password, check the box to read/accept the Terms and Conditions and click “Login”. Search by location in the address search box at the top left or navigate the map with the toolbar controls. Once you’re in the area of interest, choose which layers you want to turn on from the available data sets. 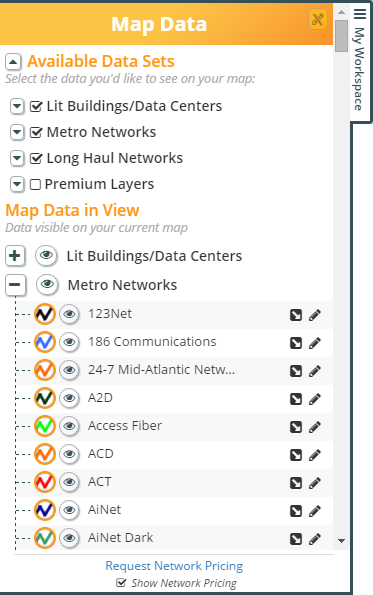 Layer controls are located in the “My Workspace” panel on the mid-lower left side of the page and include Connected Buildings which are Lit Buildings/Data Centers/Internet Exchanges, Metro Networks, Long Haul Networks, International Networks and Premium Layers, Submarine Cables and Proprietary Data. If you’ve turned on the Metro Networks and/or Long Haul Networks layers, you will see the individual carrier fiber paths represented on the map as colored lines. 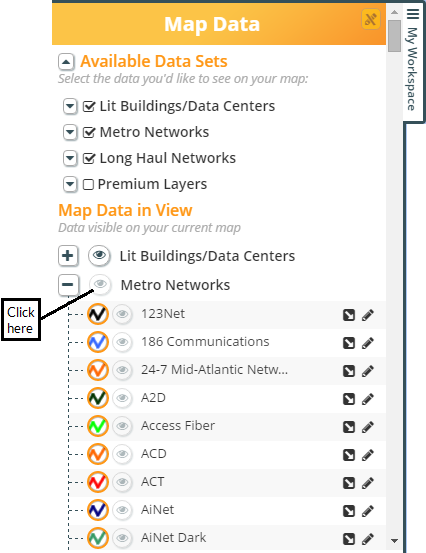 You can associate the colors with the fiber providers by opening the networks under “Map Data in View” in the My Workspace panel. 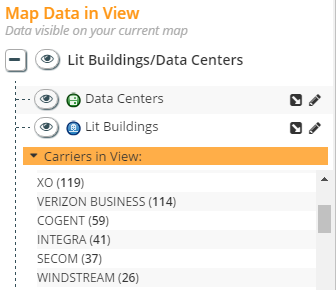 To learn more information about which carriers are represented where on your map, click directly on any individual network lines, lit building icons or data center icons. You can measure distances with the point to point measurement feature and also search for data within a radius by using the distance radius feature located in the toolbar in the top left. Once your map view is customized with your selected layers and zoom view, you can create a PDF or PNG map output from the Print Map feature located to the right of the measurement features in the toolbar in the top left. If you have multiple addresses that you need to research at a time, you can create and upload a CSV spreadsheet with up to 200 addresses or latitude and longitude coordinates into the CSV feature also located in the toolbar. The output will either be a new CSV spreadsheet or points on your map. If the building is lit, we will output every carrier it’s lit by and based on the fiber maps, we will report the 5 closest fiber providers and their distance to each address in feet. To read our list of frequently asked questions or watch our new user training videos, click on “Support & Training” in the top right corner. 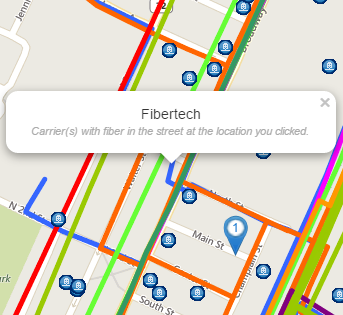 Logout from FiberLocator by clicking “Logout” in the top right corner. You will be prompted to save your map so next time you login you will come back in right where you left off. To begin, go to https://app.www.fiberlocator.com, enter your user name and password, check the box to signify that you’ve read and accept the Terms and Conditions (click on “Terms and Conditions” to review and understand the Terms and Conditions you are agreeing to) and click “Login”. Remember, the login credentials are CASE SENSITIVE. After login, your initial map view will be that of North America with all layers turned OFF. This enables you to begin your search anywhere in the US either by searching for a location or by using the zoom controls in the toolbar. You can look up a location by using the search bar at the top left of the page by typing in a street address, city, state, zip code, latitude longitude coordinates or even a landmark. Once you’ve entered text, click on the white arrow button or simply press “Enter” on your keyboard. Or you can begin navigating around the map using the controls in the navigation toolbar in the top left to the left of the search bar. The plus sign (+) zooms your map in and the minus sign (-) zooms your map out. The globe icon allows you to zoom to max extent and return to the main screen showing the full map view of the US. To navigate within the map, simply drag your screen around with your mouse. TIP #1: Search or navigate to your desired location FIRST before turning on layers. The performance and speed of the application are optimized by searching the maps without the layers activated. 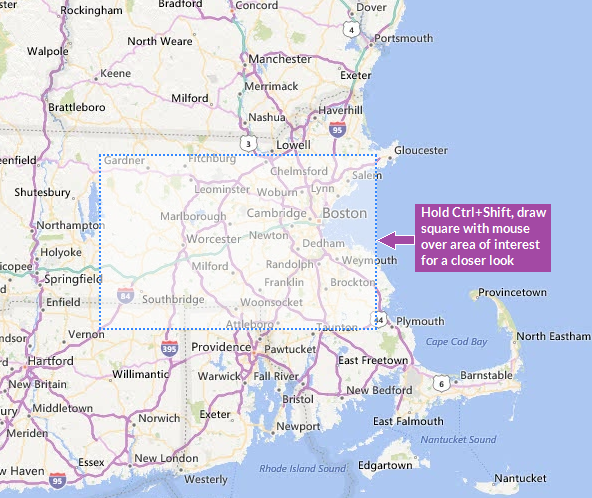 TIP #2: You can also zoom in to a specific area by holding Ctrl+Shift on your keyboard and drawing a square around the area you wish to see closer on your map. Once you are at a location of interest, now you can start applying the various data layers in FiberLocator. Check the boxes under “Available Data Sets” in your My Workspace panel. As you check off which layers you want to turn on, the layers will appear below Available Data Sets under “Map Data In View”. Here, you can see the carriers currently appearing on your map. *Note: When you open your networks under Map Data in View, the carriers that are listed at the top in bold are carriers currently “in view” on your map. The carriers that are grayed out below represent the full list of Metro or Long Haul Networks that have existing fiber maps in the tool. If you have both Metro and Long Haul Networks checked off and turned on, make sure you scroll all the way down past Metro Networks to see your list of Long Haul Networks in view. You have the option to choose the carriers in view from your map by simply clicking on the eyeball icon next to an individual carrier name. If you want to hide all carriers from either Metro Networks or Long Haul Networks without actually turning that layer off, you can click on the eyeball icon next to Metro Networks or Long Haul Networks. To turn the carrier layers back on, click on the eyeball icon a second time. You have the option to hide any of the carriers in view from your map by simply clicking on the eyeball icon next to an individual carrier name. If you want to hide all carriers from either Metro Networks or Long Haul Networks without actually turning that layer off, you can click on the eyeball icon next to Metro Networks or Long Haul Networks. To turn the carrier layers back on, click on the eyeball icon a second time. You can highlight an individual carrier by clicking the pencil icon to the right of the carrier name. This will allow you to visualize a specific carriers fiber path for your area in view and bring their colored line to the top of your screen highlighted in black. You can also highlight more than one carrier at a time. To turn off your highlight(s), click the pencil next to the highlighted carriers once more or click the yellow icon located at the top right of your My Workspace panel. TIP: You can hide your “My Workspace” panel at any time during your sessions to show a full screen view of your map by clicking on the top right where it say “My Workspace”. 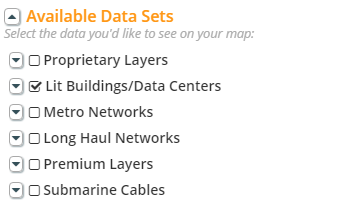 To learn more information about which carriers are represented where on your map, click directly on any individual colored network lines, lit building icons or data center icons. Once you’ve clicked on a data center (green) or lit building (blue) icon, an information box will pop up and list out the carriers on net in a lit building, the providers that offer data center services in a data center and fiber providers in the street at the location of the building you clicked on. 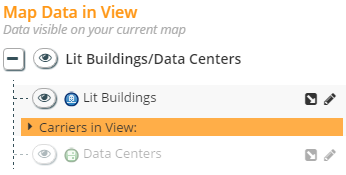 The full list of the carriers on net in all of the lit buildings currently on your screen will now show up under “Carriers in View” with a number representing the total count of buildings for each carrier. 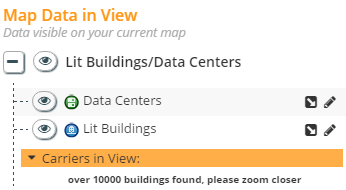 Note: If there are over 10,000 lit buildings up on your screen, the carrier list will disappear and you’ll see a message asking you to please zoom in closer. The controls in FiberLocator are straightforward and easy to use. If you hover your mouse over each icon in the toolbar, a box will pop up telling you what each icon represents. See the following diagram for an explanation of what each icon does within FiberLocator. The second icon in the toolbar lets you measure distances from point to point. 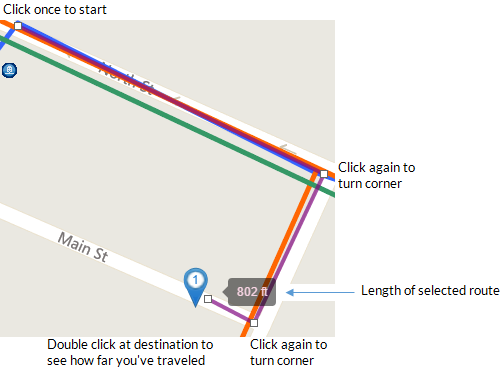 You can click multiple points on a map view to measure a total distance from starting point to ending point. Once you select the ruler icon, click anywhere on your map, move your mouse along a fiber path and click again as you turn corners. Continue clicking point to point to measure a specific path of fiber or distance and when you get to your destination, double-click to reveal how many feet or miles you have traveled. To turn this feature off, click the ruler icon once more. TIP #1: When using the measure tool, it is helpful to zoom in to the maximum extent. TIP #2: Use the point to point measurement when you’re trying to determine the current radius and zoom view on your screen. If you click once on the center of the map and double-click all the way to the right of the map, you can estimate the map radius you are currently viewing. The third icon in the toolbar is the new and improved distance radius tool. 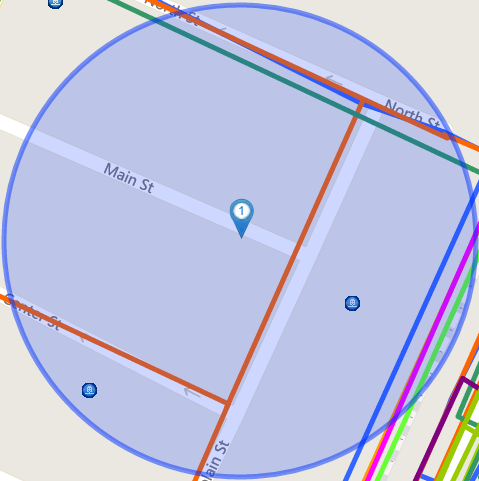 This feature lets you search for data within a specified radius and shows a highlighted area on the map that encompasses your desired radius around a specific point. TIP: Before using, first make sure you have your Metro and/or Long Haul Network layers turned on and opened under Map Data in View in your My Workspace panel. Once you click the circled ruler icon and the location of interest on your map, a box that says “search by distance” will pop up in the top right with a measurement scale. On the right where it says “Radius Distance”, drag the black box from 10 feet as far as 10 miles to select your preferred radius. As you drag the measurement back and forth, you will notice a blue circle representing the radius change in size on your map. Once you finish choosing your measurement, look under Map Data in View and you’ll see the feet or mile measurements appear next to each carrier within the radius you selected. Please note, the measurements will only pop up next to the carriers that are within your selected radius; some carriers in view will not have a measurement. To turn this feature off, click the circled ruler icon once more. The fourth icon in the toolbar allows you to output your map view along with a detailed legend to either a PDF or PNG file. 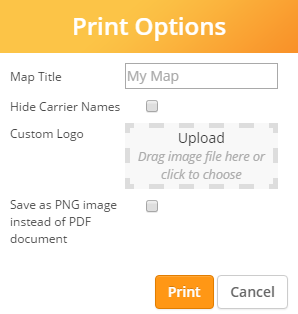 You can customize your map output by 1) renaming the map (which will appear in the top left of the PDF or PNG), 2) including or excluding carrier names (to exclude, click Hide Carrier Names), 3) adding your own custom logo by uploading or dragging the image file and 4) saving your map as a PDF or PNG. FiberLocator’s newest and most exciting addition to the toolbar is the fifth icon, the CSV batch processing tool. If your data needs require carrier information for multiple locations per project, the new CSV Batch Upload is your solution for an efficient search and fast results. This tool allows you to run a batch report for up to 200 addresses or latitude/longitude coordinates at a time. Alternatively, if you’d like to run your batch report with latitude and longitude coordinates, you can have two separate columns labeled “latitude” and “longitude”. After finalizing your CSV spreadsheet, click on the CSV icon in the toolbar and upload the file you just created by either dragging the file to the upload box or clicking on the box to select and upload the file. You will see a notification telling you that your file is ready to run. If you want to revise the file name for easy reference, you have the ability to do so by filling in a new Reference Name. Check off either Metro, Long Haul or both so your results include the appropriate types of fiber. If you have proprietary data loaded, you can also run the report against your proprietary layer. The last option is how you would like the address returned. 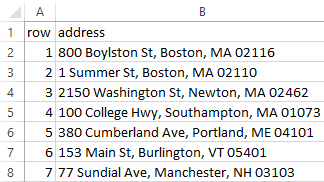 You can get results with the address all in one column or broken out by street, city, state, etc. Click “Start Batch Process” to run your report. When complete, you’ll have a choice to download the results in a brand new CSV spreadsheet or view your results as points on the FiberLocator map. Don’t worry, if you choose the wrong option, you can go back and select the other output. 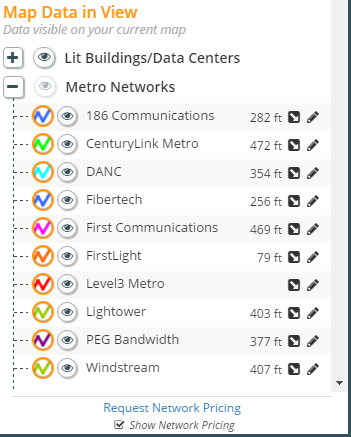 For each address in your new CSV spreadsheet or on points of your map, you’ll be able to determine if the building is lit by any of the providers in our database as well as the 5 closest fiber providers and their distance to each address. Save your new file to a format of your preference and our work is complete. TIP #1: While your results are pending, don’t feel like your workflow has been interrupted. You’ll be able to pick up where you left off before you started this batch process. Check back for your results when you’re ready. When the spinning wheel next to your file name comes to a halt and switches to a small green checkmark, you’ll know the process is complete. TIP #2: All of your previous reports will stay listed under “Previous Uploads” unless otherwise deleted. To delete, click on a previous report, then click “Delete”. TIP #3: The csv batch markers are green and the single search address markers are blue. You also have the option to include a custom ID and it will show up on each of your address markers. TIP #4: You can create PDF or PNG maps displaying your batch upload markers using the print function. The “Request Network Pricing” feature in FiberLocator allows you to leverage our team of experts. As a complimentary service to our FiberLocator users, you can submit any requests for carrier quotes through the application by simply clicking on the “Request Network Pricing” link located on the bottom of the “My Workspace Panel” or in the business information box. During FiberLocator’s regular business hours, a member of our partner network design team will contact you within 2 hours of your request. If your submission comes in after 5:00 p.m. EST, a member of our team will contact you as soon as possible the following morning. Our partner will return to you a matrix of available options from relevant providers. As a FiberLocator user, you have a couple of options for support and training. By clicking on this button in the top right corner of the tool, you are brought to a page with our Frequently Asked Questions, Training Videos and this very User Guide. You also have the option to contact us via phone or email for support. When you’re ready to end your session altogether, you can simply click on the word “Logout” next to your Support & Training button. 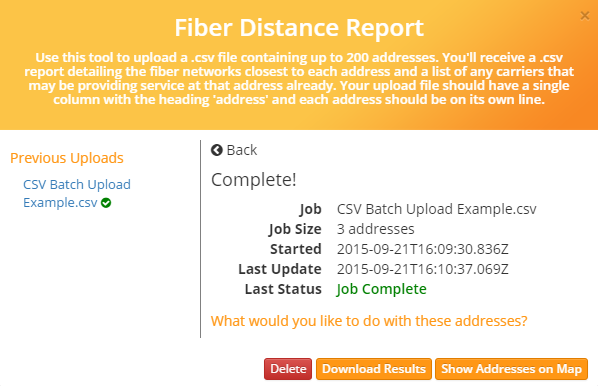 FiberLocator is constantly evolving and improving with the suggestions and feedback from users like you. Please don’t hesitate to make comments or request data, features and functions that you think would be helpful or would improve the application. Email us at support@www.fiberlocator.com with your suggestions!